Implementing a readable and maintainable persistence layer with Hibernate isn’t as easy as it might seem. It often starts with just a few annotations on some Java classes and a small number of Strings containing things like JPQL or native query statements and references to attributes, queries and bind parameter names. As the project grows, you implement more entity classes. What’s even worse, you also create hundreds of Strings that you use somewhere in your business code. This quickly transforms a small and well-structured persistence layer into a huge mess. You can avoid at least some of these problems by following the best practices I show you in this article. You can find lots of articles and videos explaining how to write maintainable Java code. All of that advice is also valid for your persistence layer. In the end, it’s still Java code, isn’t it? But that advice isn’t enough. You can follow general Java best practices and still build a messy persistence layer. 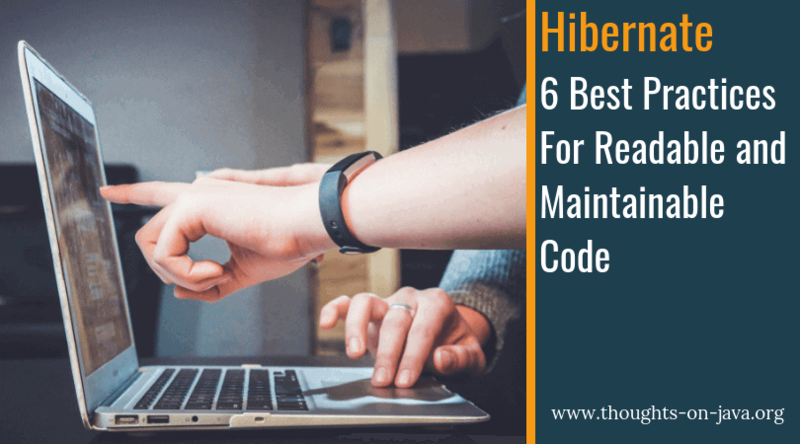 JPA and Hibernate heavily rely on String references, which quickly get unmaintainable, and the managed lifecycle introduces invisible functionalities and requirements. So, you need to take it one step further and not only follow best practices for Java. You also need to apply specific best practices for a persistence layer using JPA or Hibernate. But don’t worry. That’s much easier than you might think. After you worked on a project for several months, it’s often hard to remember where you used which String. It gets even worse if you have to refactor an entity and you need to change all Strings that reference a renamed attribute. The best and only thing you can do to avoid these problems is to introduce String constants for at least each element you reference in your business code. If you want to take it one step further, you could even introduce constants for all entity attributes. You can then use these constants in your code instead of magic Strings. You can use your IDE to find all places in your code that call a specific query or use any other named element. It gets much easier to find and reuse existing queries that already fetch the required information. If you need to rename an attribute or any other named element, you simply change the value of the String constant. So, better spend the extra effort to create the String constants. It will make your life much easier as soon as you need to change or debug your code. If you’re working with some of JPA’s APIs, like the Criteria API or the Entity Graph API, you should prefer JPA’s Metamodel classes over String constants. The metamodel consists of static classes that your persistence provider, e.g., Hibernate, can generate at build time. You can then use them in your code to reference entity attributes in a type-safe way. Unfortunately, JPA doesn’t specify how these classes get generated, and each implementation provides its own option. If you’re using Hibernate, you only need to add a dependency to the hibernate-jpamodelgen artifact to your maven pom.xml. During your next build, Hibernate generates a static class for each entity class. The following 2 code snippets show a simple example of the Order entity and the Order_ class, which describes the entity. You can then use the Order_ class with most of JPA’s APIs. I use it in the following example to select the orderNumber and customer attributes of the Order entity. Another way to improve the readability and usability of your entities is to use field-based access. It’s one of the 2 access strategies supported by JPA and Hibernate. You use it by annotating your entity attributes with the mapping annotations. That puts all mapping information at the top of the class, and you can get a quick overview of all mapped attributes. You could, for example, introduce a utility method that manages a bidirectional association. It’s easy to forget to update both ends of an association, so why not offer a method for it? It’s a general best practice for to-many associations. And while you’re working at your getter and setter methods, please check if there really is a use case that needs a setBooks method. Most often, it’s better to just offer methods that add or remove one element. Named bind parameters are an easy and effective way to improve the readability of the code that executes a query. That’s especially the case if you combine it with my first recommendation and create a String constant for it. As you can see in the previous code snippet, named bind parameters and String constants don’t provide any benefits when you define the query. But they do when you execute the query. By using a named bind parameter, you make your code easier to understand because everyone can immediately see which value it sets for which bind parameter. You can use query hints to provide additional information about a query and to activate or deactivate certain features of the EntityManager. You can use it to mark a query as read-only, activate Hibernate’s query cache, set an SQL comment, reference an entity graph that shall be applied to a query and much more. I summarized the most interesting ones in 11 JPA and Hibernate query hints every developer should know. Unfortunately, you need to provide these query hints as a String. So, we are again struggling with another form of JPA’s magic String problem. Let’s be honest, magic Strings are annoying. And that’s especially the case if they are long and complicate, like the one in the following code snippet. Thanks to the Hibernate team for providing the org.hibernate.annotations.QueryHints and the org.hibernate.graph.GraphSemantic classes with String constants for most query hints. Using that class, you can rewrite the previous example to use the GraphSemantic.FETCH constant instead of javax.persistence.fetchgraph. The last recommendation that I want to give in this article is to use the Tuple interface to handle query results that contain multiple objects. You can see an example of such a query in the following code snippet. That query selects the id and the orderNumber of an Order entity as scalar values. If you don’t want to use a DTO projection, you can either process each record as an Object or as a Tuple interface. The Tuple interface is the better option. It provides methods to access each element of a record in the resultset by index or by alias. You can even automatically cast each of them to the correct type. 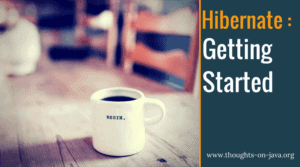 Implementing a persistence layer with Hibernate is easy. But it requires a set of best practices and a little bit of discipline to create it in a way that keeps your code readable and maintainable. You can’t create a temp table with JPQL. But you can execute the SQL statement as a native query.